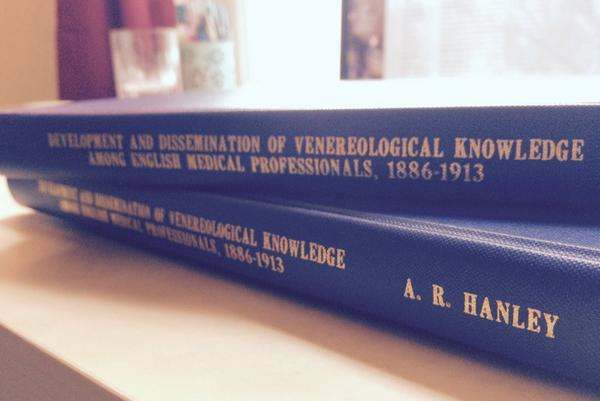 ‘Development and Dissemination of Venereological Knowledge Among English Medical Professionals 1886-1913’, PhD thesis by Dr Anne Hanley, 2014. Photo by Anne Hanley. In 1899, the British Medical Journal enthusiastically announced that a new postgraduate teaching college was to open in London. The aim of the Medical Graduates’ College and Polyclinic was to provide continuing education to general practitioners. It drew upon emerging specialisms and in so doing built upon the generalist training received at an undergraduate level. Postgraduate study was intended to introduce general practitioners to new knowledge claims and clinical practices. It offered general practitioners access to a constantly changing body of medical knowledge, allowing them to pursue special interests whilst maintaining their general practices. The establishment of postgraduate institutions such as the Medical Graduates’ College marked an important stage in the development of medical education in England. A general practitioner’s formal training was no longer thought to necessarily end with undergraduate study. The generalist nature of the undergraduate curriculum was beginning to be recognised as insufficient for effective and safe clinical practice. Postgraduate training recognised the fact that a practitioner’s knowledge constantly needed to be refreshed and augmented in systematised ways that could not be achieved simply in the course of general practice. Yet these institutions, and the emergence of postgraduate medical education more broadly, have been largely overlooked by historians. Moreover, the history of venereological training among medical undergraduates and postgraduates alike has been overlooked. The study of such special subjects characterized postgraduate study. This paper examines the dissemination of venereological knowledge among subscribers to Medical Graduates’ College as an important case study for the development of institutionalized postgraduate medical education in England at the turn of the twentieth century. A version of this paper has been published in Medical History (2015).